MONTRÉAL, QUÉBEC–(Marketwired – 13 avril 2018) – Bombardier a annoncé aujourd’hui que son spectaculaire avion d’affaires Global 7000 a reçu un Red Dot dans le cadre de l’édition 2018 des prix Red Dot pour le design de produits. Créés en 1955, les prix de design Red Dot sont remis dans le cadre d’un concours de design international prestigieux et comptent parmi les honneurs les plus convoités pour l’excellence en matière de design et d’innovation dans le monde entier. Les gagnants de cette année ont été annoncés le 9 avril à Essen, en Allemagne. L’avion d’affaires Global 7000 de Bombardier a été sélectionné par un jury de 39 personnes parmi une foule d’autres candidatures, alors que plus de 6 300 dossiers de près 60 pays se disputaient les prix dans plusieurs catégories. L’avion de dernière génération a remporté un Red Dot lors de l’édition 2018 des prix Red Dot pour le design de produits dans la catégorie des bateaux, trains et avions. Les rigoureux critères de sélection portaient entre autres sur le niveau d’innovation, la fonctionnalité, la qualité formelle, l’ergonomie et la durabilité. Bombardier today announced that its show-stopping Global 7000 business jet has been honoured with a Red Dot in the 2018 Red Dot Award: Product Design. Established in 1955, the Red Dot Design Award is a prestigious international design competition and one of the most sought-after recognitions for design and innovation excellence worldwide. This year’s winners were announced on April 9 in Essen, Germany. 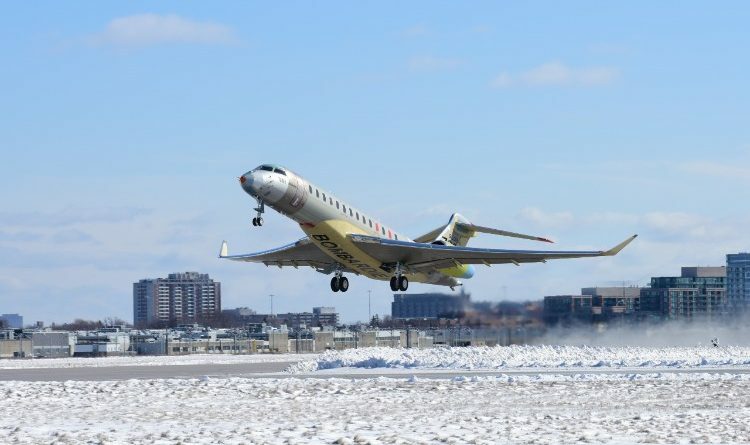 Bombardier’s Global 7000 business jet was selected by the 39-person jury from among a crowded field, with more than 6,300 submissions from close to 60 countries competing in several categories. The state-of-the art aircraft received the Red Dot in the 2018 Red Dot Award: Product Design in the ships, trains and planes category. The strict judging criteria focused on the level of innovation, functionality, formal quality, ergonomics and durability, among others. “Success in the competition is proof of the good design quality of the products and once again shows that companies are on the right path. When I speak about good design, I am referring to more than just an attractive product. All of the products are characterized by outstanding functionality. This demonstrates that the designers have understood their clients and their needs,” said Professor Dr. Peter Zec, founder and CEO of the Red Dot Award. In addition to its signature smooth ride, Bombardier’s Global 7000 aircraft, which is scheduled to enter service in the second half of 2018, is a virtual showcase for design innovation. A masterpiece of creative and thoughtful design, the Global 7000aircraft’s sophisticated styling sets the benchmark for the most exceptional business jet experience. Every detail of the cabin interior has been crafted to create a rich and satisfying experience, from its class-leading and largest kitchen in the industry and forward-thinking lighting to the first-ever dedicated stateroom with a fixed bed. The Red Dot Award is one of the most prestigious design awards worldwide and honours innovation, concepts and visions. All award-winning products will be featured in the Red Dot Design Yearbook as well as online.